Employ this series of colorful and engaging worksheets to help young learners of kindergarten and Grade 1 boost their skills at subtraction in a fun way! A variety of activities like cut-and-glue, color the pictures using the color code, and cool printable mazes are featured here! These activities are aimed to develop number and color recognition, problem-solving skills and fine motor skills. 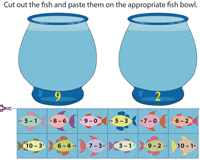 Cut out the fish, solve the subtraction problems displayed on each fish, match the differences with the numbers shown on each bowl, and finally glue the fish onto the appropriate fish bowls. Children learn equivalent subtraction sentences from this activity. 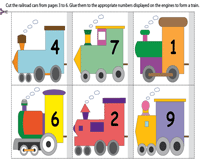 This set of activity worksheets features railroad cars and engines. Cut out the railroad cars, solve the subtraction problems displayed on each railcar, match the differences with the numbers shown on each engine and finally glue the railroad cars to the correct engine number to complete the activity. 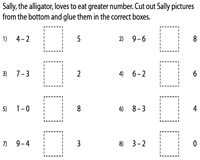 This set of activities is based on comparing the subtraction sentences using the symbol > or < represented by the alligator. Cut out the Sally, the alligator given in the bottom of the page and glue them in appropriate places to complete the activity. These uniquely themed color-by-subtraction worksheets are split into horizontal, column and mixed formats. 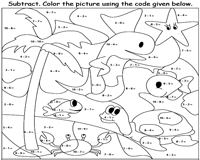 Solve the subtraction problems and color using the color-code provided to reveal the mystery pictures. 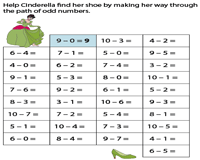 Solve the subtraction sentences to help Cindrella, Alladin and other animated characters to pave their way through the path of odd/even numbers. Six subtraction mazes are included.